Ranting Panda: Liberty comes with hands dabbled in blood! Liberty comes with hands dabbled in blood! Armchair politicians often pass an overarching assessment of politics in the Middle East, declaring that there will never be peace because "they are always fighting". 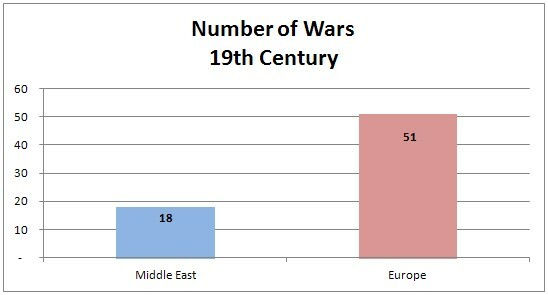 It is true that there have been a number of wars in the Middle East. 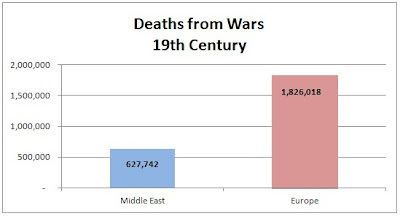 However, if such judgement is to be passed then it may be prudent to remember that the most violent continent for centuries has been Europe, which has suffered more wars and more casualties as the result of war than any other continent as the following charts show. Between 1500 and 1800AD there were 66 wars or battles of significance fought on European soil, while only 3 wars or battles of significance were fought in the Middle East. 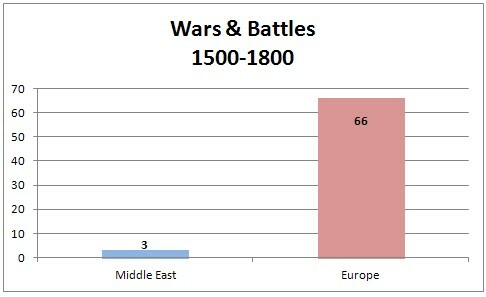 That is 22 times the number of battles in Europe than in the Middle East. In the 19th century, Europe experienced almost 3 times the number of wars and deaths than the Middle East experienced. 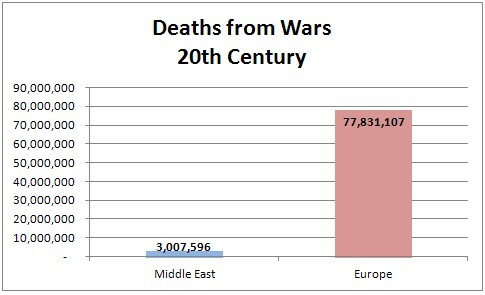 In the 20th century, deaths from war in the Middle East paled in comparison to the violence in Europe. Whilst Europe had almost twice the number of wars than the Middle East, the death toll from those wars was 25 times worse than the death toll from wars in the Middle East during that period. World War II was the worst war that the world has seen and was the result of European nationalism. Following this, the European dominated United Nations, with heavy influence from Britain, enabled the creation of Israel. A conflict borne of violence and which continues to this day in violence as a direct result of European interference in the region. Prior to that, there was the attack on the Ottoman Empire during the First World War, not because of its threat to Europe, but because of British interest in middle eastern oil. This lust for oil drove British and US corporate and military activities throughout the Middle East for most of the 20th century. Throughout the western world, racist rhetoric argues that multiculturalism doesn't work, that Asians and Arabs don't know how to integrate and that Western nations are peaceful. This rhetoric expects that people from other countries will just give up their culture, rather than retain their culture and embrace the new one. The rhetoric often includes allegations that these "foreigners" come from violent cultures while ignoring our own violent history. At some stage, each Middle Eastern despot has been encouraged and supported by the West for strategic political interests while the local population suffers. 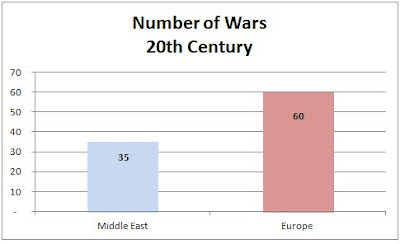 The last century has been punctuated with global conflict exported by western nations in the name of "liberty". A liberty that we believe should be thrust on other nations regardless of their wishes or needs. A liberty delivered by hands dabbled in blood! Additionally, during the Cold War, both the USA and the USSR used the world as their own violent playgrounds, waging wars and massacres in the name of their own political ideologies, whether it was dressed up as Socialism, Democracy or Liberty. The war between Iran and Iraq would most likely not have occurred had it not been for the influence of Moscow and Washington. The invasion and occupation of Afghanistan by the USSR in the 1980s would not have occurred had it not been for the agitation by the USA in encouraging Afghan insurgents to wage terrorist attacks on USSR territories. This war resulted in the creation of the Taliban and Al Qaeda; both of which received impetus through the USA funding of the Mujahideen and Osama Bin Laden during the Soviet occupation of Afghanistan. 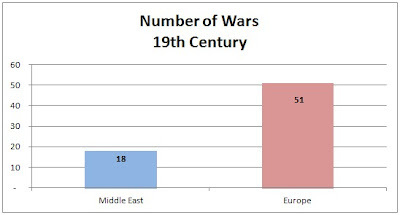 If we are to see a reduction in war, we should not be waging more war. A war on terror will only beget more war and more terrorism. We judge the Middle East as being a violent place and use that to justify invasions, attacks and wars. Yet looking at the above charts, it is the war-faring nations of Europe which are the most violent. George W. Bush once stated that "They hate our freedoms" when referring to Islamic terrorists. It isn't our freedom they hate, but the violence and injustices that have been manifested in countries across the globe as powerful European and American nations forcibly deliver blood-soaked Democracy and Liberty to the world. Yet as Oscar Wilde once said "When liberty comes with hands dabbled in blood, it is difficult to shake hands with her". Acknowledging our history and choosing not to relive it will ensure that we can have a future free from war, a future of peace. Rather than passing asinine and ill-informed judgement on people from the Middle East or other areas, we should understand their history, the impact that western nations have on them and then work together to build a better world. The following statement is reportedly from a German Muslim scholar when asked about terrorism and Islam, "Who started the First World War? Muslims? Who started the Second World War? Muslims? Who killed about 20 millions of aborigines in Australia? Muslims? Who sent the nuclear bombs of Hiroshima and Nagasaki? Muslims? Who killed more than 100 millions of Indians in North America? Muslims? Who killed nearly 50 millions of Indians in South America? Muslims? Who took about 180 millions of African people as slaves and 88% of them died and was thrown in the Atlantic Ocean? Muslims?? No, they weren't Muslims!!! First of all, you have to define terrorism properly ... if a non-Muslim do something bad, it is crime. If a Muslim commit same, he is a terrorist. So first remove this double standard ... then come to the point!!!" "Why do you look at the speck that is in your brother's eye, but do not notice the log that is in your own eye."